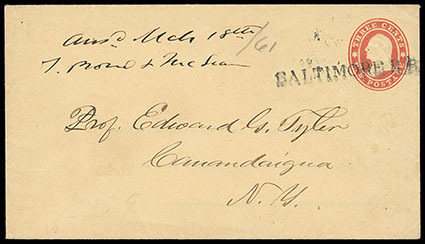 Baltimore R.R., straight line handstamp canceling on 1860, 3¢ Star Die entire to Canandaigua, N.Y., 1861 year docketing, Very Fine. Scott No. U27 Estimate $150 - 200. 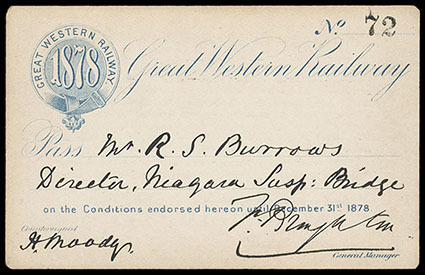 Great Western Railway, Great Western Railway, 1878, 1879 & 1880 passes to the director of the Niagara Suspension Bridge, liability clause on reverse; small tear in one pass, otherwise Very Fine. 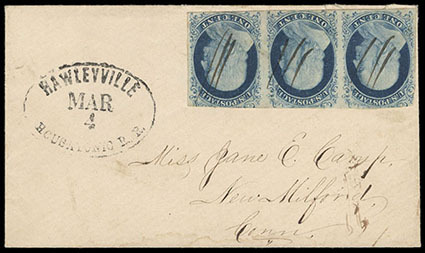 Hawleyville, Housatonic R.R., Mar 4, oval railroad station agent handstamp on cover bearing 1¢ blue, type II (7) strip of three, each neatly pen cancelled, on small cover to New Milford Conn., Very Fine and scarce railroad post office use with 1¢ 1851 Issue, Rarity VI, ex-Eno, Wenk and Conland. Towle No. 88-S-4b Estimate $300 - 400. N.Y. & Boston Stmb. 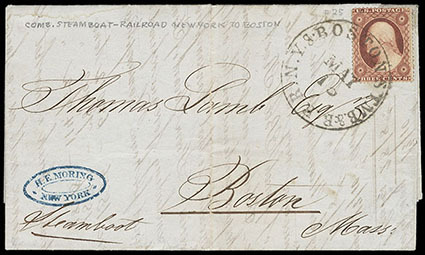 & R.R., May 15, clear strike of balloon cds tying 1857, 3¢ rose, type I on 1858 folded letter to Boston, Mass., with letter datelined from New York City, a Very Fine and choice strike. Scott No. 25 Estimate $250 - 350. Penna. R.R. 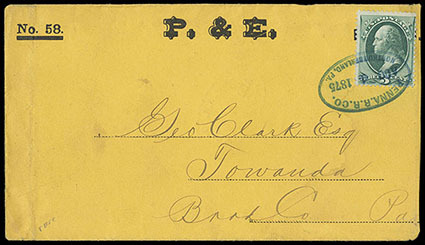 Co., Northumberland, Pa., Aug 4, 1875, bold blue oval date stamp tying 1873, 3¢ green on "P. & E." imprint cover to Towanda, Pa., with original Pennsylvania Railroad letter head enclosure letter written on "Foreign Coupon Tickets" form, additional strikes of date stamp on reverse of cover and enclosure. Scott No. 158 Estimate $400 - 600. R. & C. 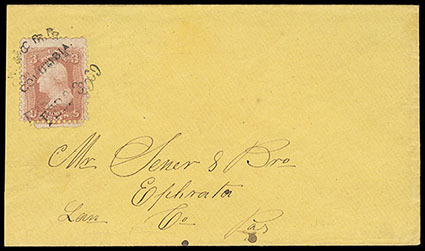 R.R., Columbia, Feb 3, 69, double strike of arc & straight line date stamp tying 1861, 3¢ rose on cover to Ephrata, Pa., Very Fine, a rare Reading & Columbia railroad postmark; with 2015 P.F. certificate. Scott No. 65. 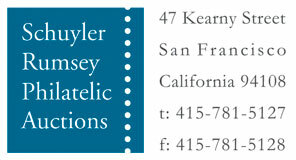 Towle No. 188-S-1 Estimate $500 - 750. 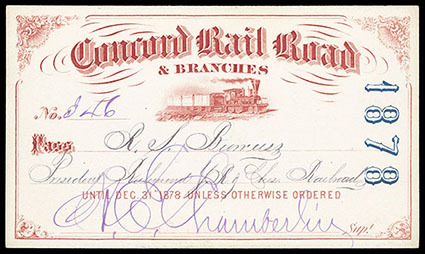 Railway Passes, four different 1878-79 passes for the Concord Rail Road, Joplin Railroad Company, Port Royal and Augusta Railway Co. and Brunswick and Albany Rail Road, Very Fine.